For Sew, Mama, Sew quilting month. 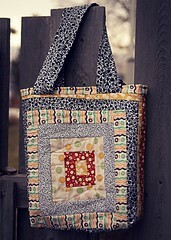 The log cabin bag I made with these fabrics. The back is done with the leftover strings and can be seen here. About 13x16x3" in size.